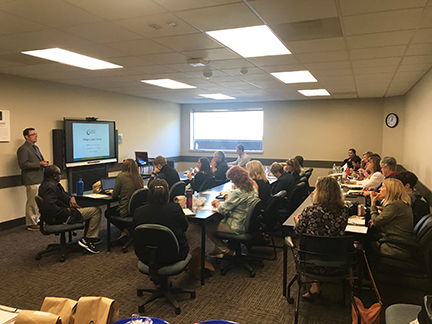 IARP Oregon serves rehabilitation professionals throughout the state of Oregon through education, professional development, and networking opportunities. Dr. Hans Carlson - "An Overview of the Management of Persistent Musculoskeletal Pain"
Mary Barros-Bailey - "Multiculturalism and Vocational Rehabilitation"
This session assists the rehabilitation professional to define multicultural issues in practice via the lens of multicultural competency standards. Through self-assessment, the practitioner develops personalized awareness of what might be some multicultural biases s/he holds, the implication to practice, and resources to help address those issues. Phillip Boswell - "Finding Your Professional Voice: Why Ethics Matter"
Ethics go to the heart of who we are, how we act and how we want others to view us. Ethics provide guidelines for what is acceptable and what is not acceptable however even the best code cannot address every situation. Codes of professional ethics identify those moral principles and standards of behavior that professions, institutions, and organizations believe will assist them in distinguishing between right and wrong, and ultimately in making good moral judgments. This presentation explores how one's code of ethics is able to assist professionals practicing in the vocational arena so that they may serve the public good. 8:00 - 9:30 am Dr. Hans Carlson - "An Overview of the Management of Persistent Musculoskeletal Pain"
9:30 - 11:30 am Phillip Boswell - "Finding Your Professional Voice: Why Ethics Matter"
Continental breakfast and buffet lunch included with event registration. Linda Hill & Associates, McCauley Potter Fain Associates and Wallace & Associates for sponsoring this event. Hello IARP Oregon Members, Are you interested in sharing your ideas and enthusiasm with your local peers in the vocational rehabilitation industry? Would you enjoy interacting with others who already are? Then the IARP Oregon Board is ready for you! Board Members at Large attend our monthly meetings in person or via phone every second Tuesday of the month except December and July. You may nominate yourself or another member – a member of IARP will call to confirm your interest prior to putting your name on the ballot. Positions begin on January 1. Following one year of participation on the Board, you may choose to run for a position on the Executive Committee including President, President Elect, Secretary, and Treasurer. In any case, being on the Board is a wonderful way to interact with your peers in the industry. Copyright © 2019 International Association of Rehabilitation Professionals. All rights reserved.